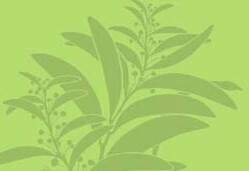 Description: Shrub or small tree, often several-stemmed. 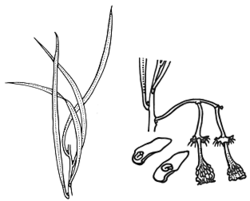 Leaves linear, 3–11 cm long, 1–3 mm wide; ± sessile; stipules often viscid. Male flowers on pedicel 1 mm long, stamens 13–19. Female flowers on pedicel 12–20 mm long, often reflexed; carpels 27–40. Fruit 9–15 mm long; column club-shaped; seeds tightly U-shaped, 3 mm long, smooth. Distribution and occurrence: Chiefly grows in rocky sites on hillsides and along creeks. Apparently now confined to the Flinders Ranges and NE Eyre Peninsula, S.A., but collected early this century along the Darling R.